Creating beautiful and thriving home aquarium is an art that can only be successful with passion and determination. 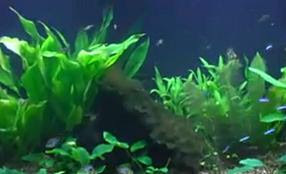 A plain and barren-looking aquarium can actually make the whole fish keeping experience dull and boring, thus it is important that a well-managed aquarium should also be complemented with the best decoration. Decorating Your Fish Tank can take up a lot of effort and time but however if you plan carefully, everything should be relatively easy. The whole setup does not necessarily has to be complicated and in fact a simple, well planned aquarium should have all the arrangements for decoration properly set in place and the idea is to come up with a basic low-maintenance design. There are of course few important points that you need to bear in mind to achieve this. 1) Avoid putting decorative item too close together and creating tight spots or gaps that your fish will try to squeeze through and injure itself. 2) Avoid creating hard-to-reach places, which will prevent proper aquarium cleaning, and this is also part of algae control. Nooks will also cause accumulation of noxious gas that can be harmful to your pet fish. 3) Avoid stacking objects especially rocks in a way that a slight bump will topple everything. Let’s look at the whole process to liven up your aquarium. First thing first, an all-glass aquarium or acrylic fish tank exposed at all sides is not an ideal setup for your fish to live in. The aquarium must at least have one section covered with aquarium background so that this will prevent light reflection that is often frowned upon when it comes to fish photography. Even your pets will appreciate this setup because they will feel more secure with the placement of background and this will also avoid jittery to the fish. Next, the base of your aquarium should be covered with gravel so that this will help to make the aquarium look more natural. Shop for the right gravel size and avoid putting calcium rich crushed coral which will cause your water pH to rise to unsuitable levels (sometimes as high as 8 and above is possible). I also do not recommend using the colorful red, blue and different brightly colored gravel because these types were actually painted and the coating can easily peel over time. Furthermore, they do not create that kind of natural aquarium look and the best choice should be the medium sized grain sand with either brown or white type. After the base is ready and the background has been put in place, then it’s time to get driftwood, large rock and decorative caves so that it can serve as hiding spot for your aquarium fish. These items must be properly rinsed and soaked in clean water for at least a week before putting into your fish tank. The driftwood should be at the center of your aquarium and becoming the focal point while other items like the rocks can be loosely scattered around the tank. The decorative caves can be placed in corners depending on your preferences. 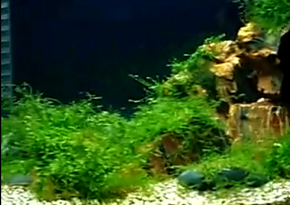 Once all these are done, the last step is to buy live aquarium plants so that it will create that natural look. Make sure that you have proper lighting suitable to promote plant growth. 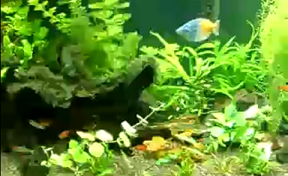 Read more on how to create and maintain planted aquarium. Looking for something creative & different?